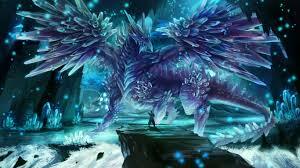 Ice Dragon वॉलपेपर. An epic वॉलपेपर of an ice dragon facing off with a human. Wallpaper and background images in the ड्रॅगन्स club tagged: photo ice dragon dragons ice dragon crystal crystals blue purple. This ड्रॅगन्स photo might contain प्रशांत चुन्नी, sardinops केरुलिया, प्रशांत सार्डिन, सार्डिनोप्स कैर्यूला, sardinops caerulea, रामबांस tequilana, एगेव टीक्विलाना, and agave tequilana.